I have two runs to report, and they leave me just six miles away from my target of a hundred. On Juneathon the 28th I returned from a long hot day at a conference and exhibition in London to find Seaford about ten degrees cooler. I took myself around Seaford Head, where I found an abundance of rabbits. I felt as if I had gate-crashed the cast party after the last night of Watership Down–the musical. The bunnies scattered right and left. The sky was heavy, and though I saw distant sunshine over Lewes, there were menacing clouds closer to home, such that I wondered how much metal I had on me as I ran over the highest parts of the route. I think the golfers would probably have been struck first. On Juneathon the 29th I ran in the morning, six miles around the back of Seaford. In a field poppies grew in the shape of a fan, the apex by some farm buildings, broadening to the base deep in a valley. Even in dull light the effect was stunning. Fog, thick fog at 5 this morning. As I went to bed the night before, the Newhaven fog-horn sounded intermittently. Apart from a cyclist, I met no one else during three miles. On we go, seventeen miles till I reach one hundred. This evening, I thought I might attempt a dressing-gown dash, in tribute to our founder, JogBlog. Note my tanned shin but lily-white ankle, the sign of someone who hasn't been in the sun except while running. An early morning run. The sea is quiet now, the sky dark over the sea, sunny over the hills by Lewes and mackerel to the east. A couple sat on the shingle at Splash Point, eating sandwiches, a curious activity at 6 in the morning. They greeted me. A fisherman sent his son back to his house to replenish his flask of tea. Twenty miles to go to reach a hundred, and five days in which to do it. Earlier in Juneathon I blogged two days running in one post, which drew a sharp 'tut, tut,' from Ms Jogblog, who oversees this festival of running and excuses. Today I shall do even worse, and bring together four days in one post. Juneathon the 22nd: a brief run after work, a mile or so round the local roads and the playing field where the feared Seaford FC have their matches. Juneathon the 23rd: a morning run before a trip to town for a picnic with old university chums. Juneathon the 24th: I had hoped to get a lot of miles done on Sunday, but it was not to be. Family responsibilities meant that the most I could manage was seven and a bit miles. The weather was uncertain and I set off wearing a rainproof top, but took it off after a couple of miles, and it became a nuisance. I went over ground I haven't covered since the spring; the vegetation is now lush and tall. Juneathon the 25th: an early morning run, bright light and a heavy dew on the grass, a flock of sheep on the land and a gaggle of geese on the water of the Cuckmere. Later, herons and egrets, and two birds of prey chasing each other in the sky over Seaford Head. Peregrines? They seemed to be rolling, diving and buzzing each other for no reason other than the joy of it. I remembered the swifts that cried outside my childhood bedroom on long June evenings; they seemed to be flying for no utilitarian reason, just because they enjoyed it. I have covered seventy-eight miles this month. To reach my target of a hundred, I need to run twenty-two in the remaining five. A modest target, but there are complications, early starts to go up to London and so on. Nevertheless, I am optimistic. With more daylight hours than any other day of the year, I still failed to run. I had a cunning plan, which was that, since I had to go to London for an evening meeting, I would Boris-bike it around the capital. In the event, when I arrived at Victoria it was wet, and I didn't want to arrive at my destination in drowned rat mode, so I took the tube. After an evening at the BMA which, on the day of the first doctors' strike for forty years, I expected to find looking something like the Smolny Institute in revolutionary Petrograd as described by John Reed, I went to find a bike for the return trip. My key wouldn't fit in any of them. Had it broken? No it looked fine; had TfL changed all the key slots without troubling to tell anyone? It seemed unlikely. I rang customer service, who told me that they keys sometimes expand in the heat. I thought that unlikely in the summer we've had so far, but perhaps the body-heat in my trousers is abnormally high. They promised to send me a new key, but I took no exercise whatsoever, part from a little light flâneur-ing around central London. Just as Stanley emerged from the jungle to grasp Livingstone by the hand, and speak those famous word, so did I enter the garden of the Tiger Inn in East Dean to find David Rowell, aka Highway Kind, aka @DOrwell. We set off up the hill to Friston church where Frank Bridge is buried, out to Crowlink and the end of the Seven Sisters, and back to East Dean. It was the most beautiful evening, the downs cropped close by sheep and rabbits, the sea flat, the world at peace. Afterwards we sat outside with pints of Legless Rambler or, in the case of David's partner, a gin and tonic. We talked of the seventies, of the great profession of librarianship, of governments past and of runs past, present and future. He will run the Victoria marathon, in British Columbia, in the autumn of 2013. This seems to me the very apotheosis of Juneathon, that runners should not only run, and blog, but should meet and talk. As we ran we agreed, I think, that more or less everything in life is like running...or is it the other way round, that running is like everything else? Another short after-work run, down to the sea and back. The sudden sunshine has sent Seafordians straight into summer mode: men in ill-judged shorts, a profusion of sunbathers outside beach huts, the kittawakes calling over the sunny cliffs. This evening I have the great privilege and pleasure of a run with Highway Kind who is visiting these parts. I have devised a gentle yet interesting route. A report will follow. 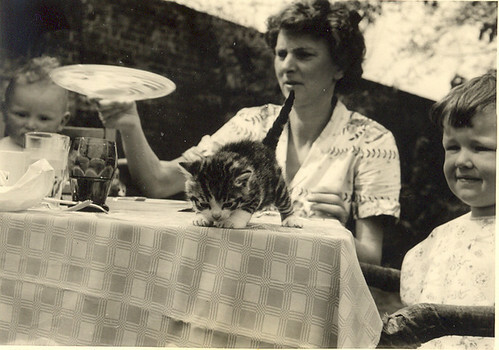 When I was a boy, on an idyllic summer afternoon, I would finish school and come home to tea in the garden with some kittens on the table. If it was a Thursday, when my father had no evening surgery, then we might borrow a punt, owned by one of his patients and lavishly appointed, and go for a trip up the Cam, and a swim. This evening was as close as it's possible to get to those afternoons of childhood. I arrived home and ran at about 6.45 p.m. but the sun was still high in the sky. I ran a short, two-mile course, to the Martello Tower and back. After a day in a roof space smelling of sewage, it was a liberation. My father was a fine runner. He ran for his college and retained a keen interest in athletics, though I can't remember him running after he tore a hamstring in the father's race at oner of my prep school sports days. He swam though, right up to his death. When he was the age I am now, 57, he would swim a mile a day, every day. He was the oldest contestant in the Swim Through Cambridge, before this annual race was abandoned because of the pollution in the Cam. By his standards, my efforts are modest. I ran, a short three miles along a well-known route. I stall felt shaky, and towards the end of the first mile wondered if I had tried too much, but I persevered. It was humid and bits of me hurt. For reasons best kept to myself, between supper on Wednesday and lunch on Saturday, no food passed my lips. I know that's not terribly long. Hunger strikers live for weeks and months without food but, for someone who fancies himself a trencherman. it's an eternity. While it may have left me fashionably thin, it weakened me. I had reserves of energy to cope with Thursday and Friday's runs, but when it came to Saturday I had had it; I could not face swimming coaching or running. I am now eating again, and will try a run this afternoon. I still feel weak and a little dizzy, but I attribute that to two days without food. It's been an odd experience. When ill or in hospital, my imagination takes off. At night I dream the most baroque dreams, while by day I can understand how an invalid like Proust could have been so creative…or I think I can. I know that the reality of illness is less lying in a cork-lined room, dashing off a sonnet here and a novella there while sipping champagne, and more a bleak hospital bed with foul food, the cries of the elderly and demented, and being at the mercy of people who do painful and degrading things to you. I'm a doctor's son and I work in the NHS: I know whereof I speak.